Sarah Hodges, a UK chemical engineering major and student research scientist at the UK Center for Applied Energy Research (CAER), is a participant in the KY-WV LSAMP program. Photo courtesy of UK CAER. LEXINGTON, Ky. (Oct. 5, 2018) — The Kentucky-West Virginia Louis Stokes Alliance for Minority Participation (KY-WV LSAMP) consortium, spearheaded by the University of Kentucky, has received $3.5 million in renewed funding over the next five years by the National Science Foundation (NSF). The award will assist the alliance's 10 institutions of higher learning from across the two states to continue its efforts in increasing the number of underrepresented students completing degrees in the fields of science, technology, engineering and mathematics (STEM). 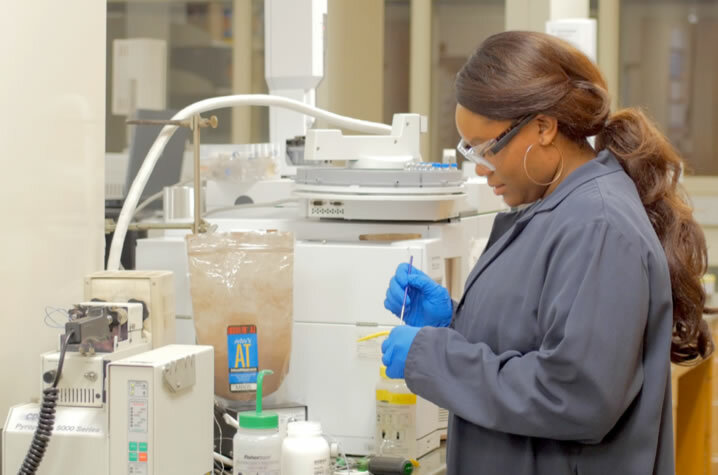 Though the representation of groups such as black and Hispanic Americans is increasing in society, these groups are still underrepresented in the STEM fields. Programs such as LSAMP help to increase the numbers by recruiting, supporting and preparing highly qualified students from these underrepresented populations. In addition to UK, the alliance includes the Bluegrass Community and Technical College, Centre College, Jefferson Community and Technical College, Kentucky State University, Marshall University, the University of Louisville, West Virginia State University, West Virginia University, and Western Kentucky University. "At the University of Kentucky, we know that working collaboratively is the best way to achieve meaningful and lasting change; that’s why we are proud to lead this alliance of outstanding public and private institutions in our region," said UK President Eli Capilouto, who serves as principal investigator (PI) on the project. "The LSAMP initiative reflects our land grant mission and provides exciting opportunities for underrepresented students to explore STEM fields. This underscores our commitment to building our workforce and creating a brighter future for our state and region." Coordinated by Capilouto, director Fara Williams and co-PI and UK College of Engineering Associate Professor Johné Parker, UK has led the KY-WV LSAMP program since it was created in 2006, and this new grant represents a third phase of the project, continuing through 2023. Over the last 12 years, the program has achieved and surpassed its goals of enrolling and graduating more underrepresented students in STEM. Alliance-wide, the institutions granted 1,177 degrees (including 362 from UK) from 2013 to 2018 — exceeding the goal of 1,000 total. During that same time period, an average of 2,306 underrepresented students were in enrolled per year in STEM degree programs — topping that goal of 2,000. "With the new funding, KY-WV LSAMP adds Jefferson Community and Technical College to the alliance, and new activities include an exchange of participants with other LSAMP alliances for summer research, increasing program outreach activities with K-12 institutions, and increasing the number of opportunities for participants to have international experiences, including summer research," Williams said. "KY-WV LSAMP also now qualifies to apply for graduate student funding through the LSAMP Bridge to the Doctorate initiative. The alliance will also conduct a research study on the effectiveness of program activities. This research will be led by West Virginia University." New goals for this third phase include increasing degrees to an average of 380 per year, and have at least 50 percent of LSAMP graduates pursue graduate programs. UK's LSAMP program currently has about 40 participants, and in the last two years, the alliance has had over a dozen international experiences for its students, including three LSAMP scholars from UK. The number of UK students enrolled in STEM majors has increased 259 percent since KY-WV LSAMP was initiated in 2006, and the number of STEM bachelor's degrees awarded to underrepresented students has increased 348 percent in the same time period. Additional co-PIs on the NSF grant include Kazi Javed, associate professor of chemistry at Kentucky State University; David Miller, professor of mathematics at West Virginia University; and Lynnette Michaluk, research assistant professor at West Virginia University. National studies show that underrepresented students enroll as STEM majors at the same rate as their counterparts, but graduate at significantly lower rates. The LSAMP project abstract asserts that the key to retention will be the provision of timely and effective individual support as needed, based on real-time tracking and both faculty and peer mentoring. The NSF LSAMP program began in 1991 with six alliances, and now includes over 40 alliances and six regional centers. The program provides funding to alliances that implement comprehensive, evidence-based, innovative and sustained strategies that result in the graduation of well-prepared, highly qualified students from underrepresented groups who pursue graduate studies or careers in STEM. The program defines underrepresented groups as black, Hispanic, Native American and Pacific Islander.